(05.07.2018) This booklet is based in large part on the contributions of the conference “Eritrea and the Ongoing Refugee Crisis”, which took place in Brussels on 19 October 2017. Some of the speeches were written and edited by the editors. Other contributions were provided by the speakers themselves. The editors have supplemented this with up-to-date information and articles in order to provide a comprehensive overview of the situation in Eritrea, the situation of Eritrean refugees and initiatives and activities. The conference was organized by the Eritrean Movement for Democracy and Human Rights, Europe External Policy Advisors (EEPA), PRO ASYL e.V., Connection e.V., War Resisters’ International and the Eritrean Law Society. Download of the pdf-file here. 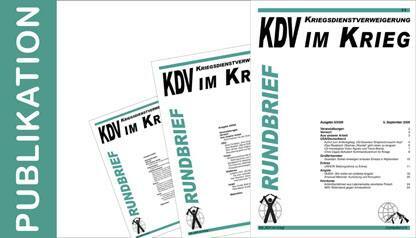 (05.09.2009) Here you can find English articles of the German edition of newsletter "CO in War" September 2009. It includes information about antimilitaristic work, recruitment, conscientious objection and asylum to USA, Germany, Great Britain, Eritrea, Angola and Honduras. 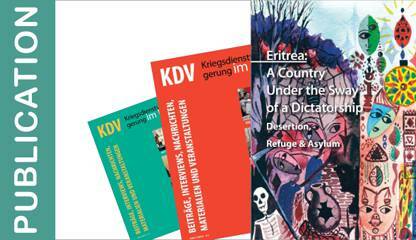 (01.03.2005) In autumn 2004, the Germany based Eritrean Antimilitarist Initiative and Connection e.V. 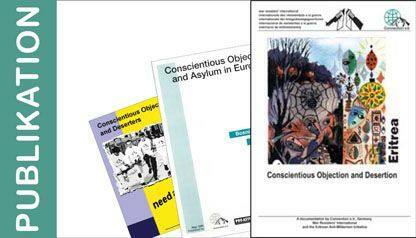 published a documentation on conscientious objection and desertion in Eritrea. The core of this documentation, interviews with refugees from Eritrea, who managed to escape from violence and war, and who now face the European Unions anti-asylum policy, give a very moving impression of the plight of young Eritreans, male and female, who grow up in an extremely militarised environment.